Mod_cfml is a suite of programs that automatically configure Tomcat to support web hosts that are already configured in your web server. Mod_cfml has two components that need to be installed in order to function properly: the Web Server Component and the Tomcat Component. The Web Server Component takes your web servers configuration, and passes that information to the Tomcat Component (a Tomcat valve). The Tomcat valve then creates hosts in Tomcat automatically based on the information that is sent to it from the Web Server Component. The Web Server Component consists of the mod_cfml.so module for Apache or the BonCode Connector for IIS. 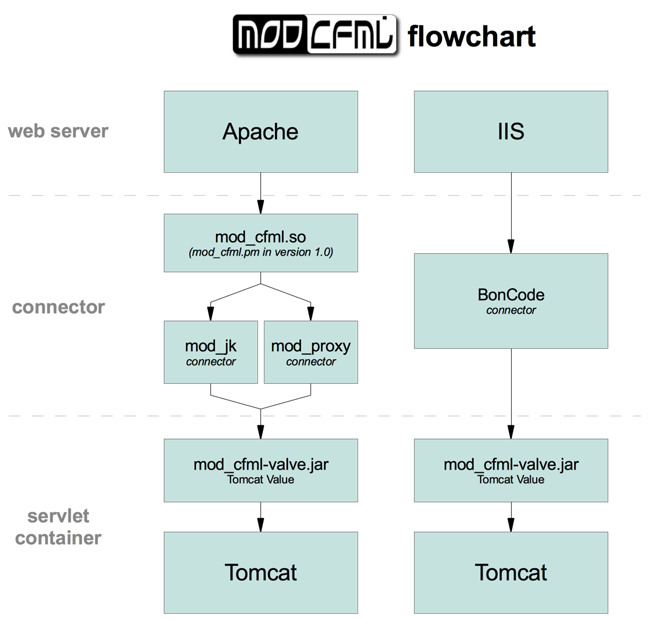 The mod_cfml.so Apache module is not a "connector" on it's own, so you will need to use it in conjunction with either mod_proxy or mod_jk which perform the actual Tomcat connection. If you don't know what a "connector" is, don't worry! This documentation includes a quick install of mod_proxy, which is a great connector if you don't have one installed already. Mod_cfml has been tested with mod_proxy and mod_jk and either will work just fine.